Pour 1 gallon whole milk into pot and heat to 190 degrees F. Stir gently while heating. Once it’s heated, hold the temperature for about 15 minutes. Add 1 tsp Citric Acid to 2 cups of warm water, and stir until dissolved. Let whole milk in pot decrease in temperature to 170 degrees F, then slowly add in the warm water with Citric Acid solution. Continue stirring the milk until the curds (solids) and when (liquids) separate. Once they are separated, stop stirring and let it rest for about 15 minutes. While the curds rest, place a sterilized colander into a large bowl and line it with butter muslin. Ladle the curds into the muslin-lined colander and let the curds drain for about 30 minutes, gently stirring every 10 minutes to help the liquid drain. Gather the muslin and twist the ends until the curds become a firm ball. Keep the ball of curds in the colander and place a small plate over the top. Use the gallon jug from the whole milk, fill it with water, and put the jug on the top of the plate to help press out the liquid for 10-15 minutes. Once the ball of curds has become fully firm, unwrap the cheese and slice into cubes or place in a sealed container in the refrigerator. The cheese should still be useable for 4-7 days. 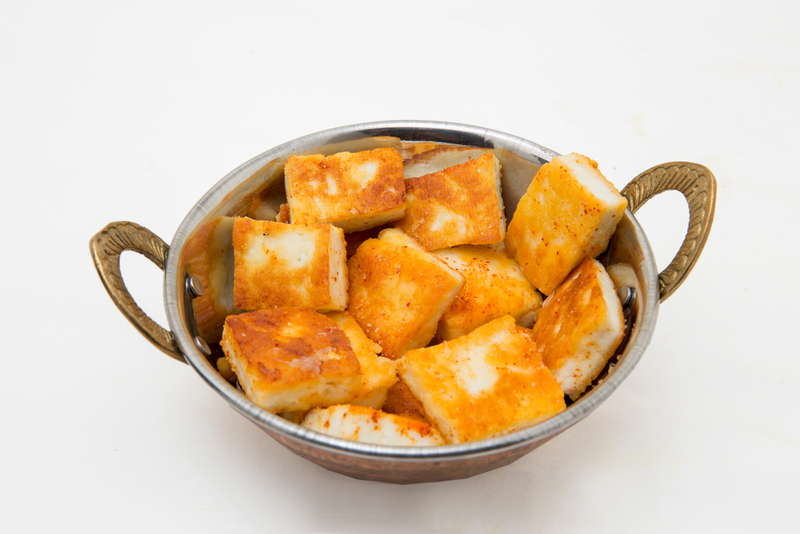 Before using, if you want the cheese cubes fried, simply place a couple of Tablespoons ghee (clarified butter) or oil in a skillet and fry the cubes for a few minutes on each side and place on paper towels to drain. This keeps the cheese cubes from falling apart if you are going to cook these in a sauce mixture.